It's apple season. Thankfully, both of our trees have apples this year, which is a big improvement over last year. It used to be that we'd do assembly line apple pies each fall. But to tell the truth, I think we over did it a couple of years ago. We made so many we never ate them all, and I'm not really so big on apple pie anymore. This year, I think I'm going to do a lot of applesauce. The thick, chunky type. The boys love applesauce, and it'll store well. We have an apple/peeler/corer deal, but our little green apples are small, black spotted, and wonky-shaped, so sometimes it seems more fruitful to use a sharp paring knife. I don't know why, but whenever I'm peeling apples, I always feel connected to the women who farmed this land before me. I wonder who planted the three apple trees (there used to be three, anyhow, until Paul overzealously trimmed one), and if they waited patiently to see if they would bear fruit. 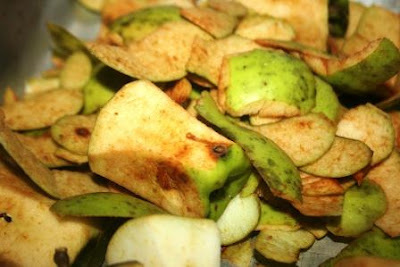 I imagine apple pies trimmed out and baked, cooling on the old (now gone) wooden farmhouse windows in the fall. Would the women who farmed this land before be pleased to see me here today, delicately peeling away the skin from the apples of the trees they planted, storing up food for my family come winter? I imagine that - even if I'm not related by blood - they would be happy to see the apples continually appreciated after all these years. It's Rural Thursday! Time to link up with Nancy from A Rural Journal and myself with your stories of the rural life. Is Fall starting to show itself in your neck of the woods? We want to hear all about it. Just grab the code below the button and paste it into your blog. Then come back and add your website to the linky. Please remember to comment on the posts of at least 5 other participants. Can't wait to see what you write today! apples drive me crazy. I love to have like an apple pie or crisp, but beyond that apples are allergic to me, or I them. good on you to be doing apples but hope you survive. I love apple pie and haven't had any in a long time. Like most things, if I had apple trees I'd probably get burned out on it. Chunky applesauce sounds delicious and I know your children will enjoy it during the winter months. It's always fun to think about the folks who planted the trees/flowers etc. before us. I imagine they treasured every apple from the three trees and would be very pleased that you and your family still enjoy the apples. No apples on my trees this year. Last spring the weather was warm way too early, the apple trees blossomed and then a heavy frost hit. Booo! ok that's it! i'm making an apple pie this weekend...this is the second apple post i've seen this morning!! We would love your apple pies. Beautiful picture - I love apples. I sure understand you're feeling a link to the past when you pick and pick your apples. I feel the same when I can. If you have a bunch of apples to make sauce out of, you could go to the community cannery at callaway, right behind the school and they have industrial size equipment that processes the apples and big pots to cook in and then they waterbath/steam the jars. Churches go there and make huge batches of sauce to use in apple butter making but small batches are no problem. I was there last year and people that I didn't know were helping me to do stuff, I was canning butternut which required their high temperature pressure cookers. Oh I love feeling that connection to the land Lisa!I don't have apple trees but know exactly what you are explaining and feel that about rhubarb on the prairie. I would love some apples though and hope to have a friend give a box this fall. Thanks for Rural Thursdays. every fall, we'd pick buckets of apples and my sister and i would sit with our mom and peel, core and slice apples. we froze a ton for pies and crumbles/crisps. we also made a ton of applesauce. i always had to use the hand colander press. :) i loved it all and would love to have a moment of that back. Yummy! I'm thinking apple pie, apple crisp, applesauce, all of which I love! Oh yes, now is time for fruits and herbs. Great autumn ! I think it's wonderful that you're taking the fruit that's available now and making something of it to store for winter. Applesauce is good and healthy and such a great way to use a lot of apples. I'm sure your "foremothers" would appreciate what you're doing! one of my favorite things to do in the fall - off to the apple orchards and then off to make a delicious pie! Have you tried making apple butter? Yum. I have still not had a good crisp apple this season, and now I need one more than ever! Yummmm - apple season - one of my very favorites!! The applesauce is a great idea, but if you find yourself with too many pies - feel free to ship it on out east! ;-) Happy apple picking! How wonderful to have apple trees. I think applesauce sounds like a great plan. I love your visions from the past. I love Fall, it's my favorite season. And it always starts with a trip to a local orchard for apple picking.,.then the leaves change, pumpkins start adorning front porches, and the fairs start. After reading your post, I may need to go apple picking this weekend! Very interesting live that apple season. Greetings. We were just talking last night that the apples on our tree are only a week or so away from being ready - we got that first frost for them just this week, so it should be soon! I've helped a friend make applesauce. Excellent choice of what to do with this year's harvest. that was some amazing imagery. also. send me applesauce. I know that feeling of connection when handling the produce from trees, etc... planted before our time. I used to help Granny A make applesauce, can asparagus, etc.... from plantings made in her grandmother's time. There were times you could almost see them there, nodding their approval. I think about stuff like that when I go down to the shack. I have often chuckled as I cleaned lantern globes for the evening while TJ chopped kindling and brought firewood inside to prepare for the long cold night. I don't care for the taste of apples, but I enjoy the scent of them baking in pies. The gathering and deciding what to do with them would be a fun time I would think. I have got tons of apples from one tree this year. The second tree has never once produced an apple. I usually give the apples to our church and they make pies and such. I'm trying to imagine too much apple pie. Applesauce sounds delish, too! Your thoughts of the women who came before is so heartfelt and something I've done myself. That was really fun to read and to hear about your thoughts. I like that connection to the past! I also would really like the applesauce you may be making! a beautiful picture of a simplier time!! apple crisp is my all time favorite and i have an awesome recipe!! I need to go get some apples and freeze them. We have just been so busy that I haven't even thought of it. I found an apple butter recipe using no sugar that I want to try. I sure do miss having our own apples.. lucky you. So lucky to have apples this year! In my area, the apple trees were all affected by a late April snowstorm, and many of the orchards are "apple-less". Great shot of a fall tradition! I think apples are my favorite fruit - you can do so many things with them. I liked to pack big chunks so I could get a bag out and make a pie or boil to make sauce. I froze mine in lemonade. Yum apple..that looks delicious and fun to do. One of the things I miss most about South Carolina is going apple picking. I love how you think of the women that came before you. I'm sure they would be very proud of what you are doing! I wish my kids ate apple sauce. They eat apples so I guess I should be grateful for that! How wonderful to have your own apple trees. I do not believe that we will have much of an apple crop around here this year on account of the drought and it being against the religion of many to irrigate (yeah, I was just kidding about that last part--kinda). We have an apple tree too and it is easier to use a paring knife, haha. I can apple pie filling but mostly do our apples up in applesauce and apple butter. Yum!